Noise & shock reduction with noticeable shorter key travel and boost in typing speed. 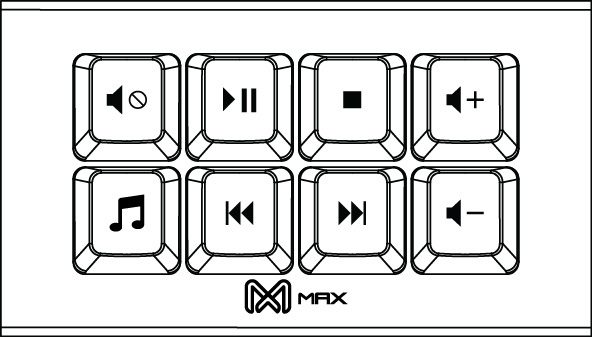 MAX Falcon-8 RGB custom programmable mini 8-key keyboard/keypad/Macropad. Each key allows you to reprogram and use it as macro keypad or even dedicated shortcut keys. With our simple and easy programming app, you can now create your own macros / media keys and combination keys without any coding experience to increase your daily productivity. NOTE: This is an assembled unit, we will install PCB, mount all the switches, solder it and put on all the keycaps. A great little device which means I don't have to worry about not having media keys on my keyboard. The included rubber pads are great to prevent the device slipping or scratching the desk. A brilliant little device. I use it so I've got multimedia keys even if my keyboard doesn't. Product is exactly as expected. The provided rubber pads are ideal, and the pretty metal case is shaped in a way that allows you to do whatever you want with the product. Mine is now attached - in a removable way - to the side of my DIY desk PC, in exactly the way I was hoping it would be. Ordered one of these so I can have macro keys without having to buy a keyboard with dedicated macro keys. It arrived well packaged, the software works perfectly and the build quality is great. Build quality is solid as advertised and software is user friendly enough. would recommend. Love this thing, even supports clicks and switches the config based on the app I'm in. Config tool is easy yet extensive. Great for making colleagues jealous.